Welcome back! I'm so glad you could join the Stampin' Up! Artisan Design Team for our last Blog Hop of May! Today is a very special hop. We are each giving away some sort of blog candy including our featured cards on this post and/or Stampin' Up! product! You'll want to comment on each person's post so you have a chance to win each prize (but no more than one prize per person). You might have just arrived from Jeanna’s blog. If not, make sure you go all the way around the hop to get to her terrific project! For my post today, I made a card featuring several new items. The base is made from the new color Smoky Slate Cardstock. The patterned paper is also a new color, Strawberry Slush, from the new Quatrefancy Specialty Designer Series Paper. I pierced around the edges of this pattern to give it a little more texture. The Night of Navy Cardstock is embossed with the new Modern Mosaic Textured Impressions Embossing Folder. The wonderful ribbon is the new Chevron Ribbon in Smoky Slate, and it will also come in several other colors in the new catalog. Here's a close-up of the card front. The greeting is stamped in Night of Navy, and is from the new Really Good Greetings Stamp Set. The small images are from the Mosaic Madness Stamp Set and were first stamped off in Strawberry Slush, then onto the card so they were lighter than the cardstock. The little flowers were punced from Strawberry Slush Cardstock with a punch from the Punch Pack. Then, the smallest gem from the Basic Rhinestones Jewel Accents was added to the center of each. This whole piece was attached with Stampin' Dimensionals. Well, that is all for today. You’ll want to join us again next Wednesday as we feature another hop with all new projects featuring lots of new products from the new catalog! And, don’t forget to click to get to Sarah’s Blog for the next stop on the hop. You won’t want to miss her creative project. Thanks for stopping by! Happy Memorial Day to those in the U.S.! Today I have another couple of cards to share in the something old, something new category. I'll start with the something old card. This card uses several patterns from the Storytime Designer Series Paper. Love these patterns! So cute and trendy. The apple stamp is part of the Perfectly Preserved Clear-Mount Stamp Set, and I die cut both the apple and the stem using the Cannery Set Framelits Dies. I really love this set and dies, so I'm going to keep them in my stash! I'm sad they aren't going to be in the new catalog, so get yours while you can. The medallion for the apple was made using the 1 3/4" Scallop Circle Punch from Riding Hood Red Cardstock (a retiring color), the 1 3/8" Circle Punch from Wild Wasabi Cardstock, and a 1 1/4" Circle Punch from the also retiring First Edition Specialty Designer Series Paper (which is already sold out). The greeting (Thanks Teacher) is stamped in Riding Hood Red Ink (also retiring) and Basic Gray Ink using the Designer Typeset Photopolymer Stamp Set which is a current item. Now, for something new! The stamp set is a new hostess set called Banner Greetings, and it is stamped in Melon Mambo and trimmed out with scissors. The patterned paper rectangle is from the new Gingham Garden Designer Series Paper. The banners are pieces of awesome new washi tape from the Gingham Garden Designer Washi Tape! I especially love the floral pattern in this set of tape, and I also love that they are all slightly different widths. So pretty! Here is a close-up of the cardfront.The patterned paper is popped up on Stampin' Dimensionals, and the banner is popped up above that on additional Stampin' Dimensionals and attached with Tombow Multi-Glue to a flat-tooth pick. These are great for attaching to cards as they don't have any sharp points and lay flat so they attach more easily to the paper surface. 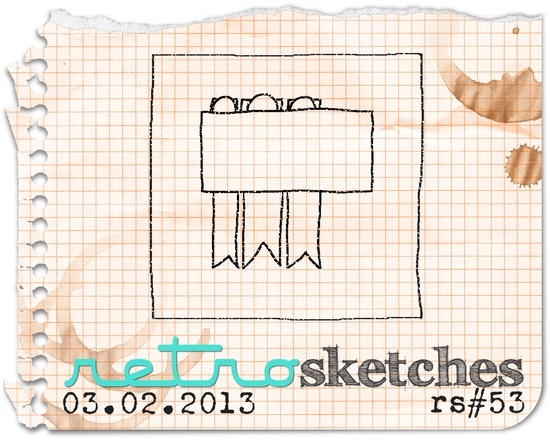 Also, for this card I started with this great sketch that I had pinned from Retro Sketches. Well, that is all for today! Thanks for stopping by. Don't forget to join us this Wednesday for another Artisan Design Team Blog Hop. I'll be giving away some blog candy to one lucky commenter, so be sure to stop by then! Welcome back! I have another card to share featuring retiring stamps and/or accessories and more sneak peeks of new items that have made their way to my house. So, it's installment #2 of something old and something new together. Thankfully the Storybook Friends Clear-Mount Stamp Set is sticking around in the new catalog, but the Tea For Two Designer Series Paper from the Spring Catalog will be gone after May 31st. I love this paper, and will miss it in this color combination. (But, it will be returning in another color scheme that can be ordered starting May 31st!) I stamped the little fox in Jet Black Stazon on Watercolor Paper, and I watercolored him! I actually used the Island Indigo ribbon from this year's Sale-a-Bration, but also did another version of this card using the Island Indigo 3/8 Inch Ruffled Ribbon, which is my my all-time favorite ribbon! I might have stocked up on that also...just saying. I used the Printed 2011 In Color Designer Brads in Island Indigo. The Island Indigo Baker's Twine is sticking around, and I love using it as a finishing touch. On the top of the watercolor piece I used an old 1/8" circle punch, and just cut the little slits with scissors to make it look like a notebook paper edge. Next up, lots of new stuff here! The card base is made from a piece of Pool Party Core'dinations Cardstock, which is sticking around from the Spring Catalog. The chevron paper is from the new 2013-2015 In Colors Designer Series Paper Stack and the color is called Coastal Cabana. I think you'll be seeing a lot of that color around here! And, I really love the new patterns in the paper stack. Chevrons are very trendy! The greeting is from the new Really Good Greetings Clear Mount Stamp Set, and is stamped in Basic Gray ink. The flowers are using another new In Color called Strawberry Slush. All of these products will be available beginning May 31st! From May 31 to June 3, you can order from both the old and new catalogs. To make the flowers at the top, I punched a piece of Strawberry Slush cardstock with the 1 1/4" Scallop Circle Punch, wrinkled it all up and then pulled it apart into two layers. Next, I punched a piece of Strawberry Slush patterned paper from the stack with a 7/8" Scallop Circle Punch.These were layered with So Saffron buttons from the retiring Subtles Designer Buttons with White Baker's Twine tied in the middle. (Can't wait to get my hands on the new style of buttons!) The banner piece is popped up on Stampin' Dimensionals. Welcome back! I'm so glad you could join the Stampin' Up! Artisan Design Team for our next Blog Hop of May! Today we are featuring projects with new supplies for the month of May. You might have just arrived from Jeanna’s blog. If not, make sure you go all the way around the hop and get to her terrific project! Today I'm going to share a scrapbook page with you. This one is sized 8" x 8", and features pictures of my Dad and my dog Monty. I used the patterns from the Beyond Plaid Clear Mount stamp set along with the colors Gumball Green, Midnight Muse and Island Indigo to make several banners to use to focus on the patterns. I used the watch from the Dapper Dad set to go with the theme of my page, "time" with Dad. I used a couple of patterned papers from the 2012-2014 In Color Paper Stack. The watch is stamped in Versamark on Basic Gray Cardstock, and embossed with Silver Stampin' Emboss Powder. I trimmed it out by hand. I also punched a 1" circle from a Window Sheet, and adhered the edges with Crystal Effects. The title was stamped with the Photopolymer Designer Typeset stamp set. Here is an even closer view of the watch so you can see the Window Sheet in action. Well, that is all for today. You’ll want to join us again next Wednesday as we feature another hop with all new projects! And, don’t forget to click to get to Sarah’s Blog for the next stop on the hop. You won’t want to miss her amazing project. Thanks for stopping by! Welcome back! I'm so glad you could join the Stampin' Up! Artisan Design Team for our next Blog Hop of May! Today we are featuring projects with new supplies for the month of May. You might have just arrived from Jeanna’s blog. If not, make sure you go all around the hop and get to her terrific project! Today, I decided to use one of the kraft boxes that we were sent this month to hold a set of small cards that could be tucked into a gift of some sort. I used Calypso Coral and Summer Starfruit Designer Series Papers and Calypso Coral Baker's Twine to decorate the box with. Keeping it simple today! So, what is tucked inside you ask? This little set of 3"x3" cards! The cards are made from Old Olive and Soft Suede Cardstock, and I used the 2 1/2" Circle Punch to make the opening in each card front. I backed the openings with Very Vanilla cardstock. I colored each of the flowers from the Best of Flowers set with markers in Old Olive, Soft Suede, Calypso Coral and Summer Starfruit, stamped them onto the Very Vanilla and used a blender pen to soften up the petals. The friend greeting is from the Amazing Family Clear Mount Stamp Set, and is stamped in Calypso Coral onto Vellum Cardstock. I just cut the stamped strip, and folded the edges around the card front to adhere it. I used some Calypso Coral Baker's Twine again to finish up the cards. Here is a close-up of my favorite card in the bunch. If I would have thought about it before they were assembled, I would have added some paper piercing around the circle on the card front as an extra touch. But if you need a quick gift, I think this whole project came together in about 1 1/2 hours. Not too bad! Well, that is all for today. Also, you’ll want to join us again next Wednesday as we feature another hop with all new projects! And, don’t forget to click to get to Sarah’s Blog for the next stop on the hop. You won’t want to miss her amazing project. Thanks for stopping by! Welcome back! I'm so glad you could join the Stampin' Up! Artisan Design Team for our next Blog Hop of May! Today we are featuring projects with new supplies for the month of May. You'll probably see lots of ideas for Mother's Day and Father's Day coming up. You might have just arrived from Jeanna’s blog. If not, make sure you go all around the hop and get to her beautiful project! For today's hop, I made a Mother's Day card...because I need one! I also need to pop this baby in the mail soon, or it won't get to my Mom in time. But, I digress! This card uses one of the flowers from the Best Of Flowers Clear-mount Stamp Set. Have you seen the "Best of" sets? They are special sets released one per month, with some of the best images over Stampin' Up! 's 25 years all gathered around a different theme each month. The April set focuses on flowers, and my Mom loves flowers. I used Calypso Coral and Old Olive markers on the flower stamp, and stamped it twice across a piece of Summer Starfruit cardstock. The greetings are from the Amazing Family Clear-Mount Stamp Set stamped in Soft Suede, and the decorative element at the top is from the same set stamped in Calypso Coral. I added a few Rhinestone Basic Jewels to the top as well. I added a piece of Old Olive 3/8" Striped Organdy Ribbon next, and also stamped the Amazing Accent Stampin' Around Standard Wheel with Calypso Coral ink on a piece of Calypso Coral cardstock.The card front has a piece of Summer Starfruit from the 2012-2014 In Color Paper Stack. I also diecut a strip of Soft Suede cardstock using the Finishing Touches Edgelits Dies. The strip was adhered to the stamped panel, and the whole thing was adhere to the card front with Stampin' Dimensionals. Well, that is all for today. You will find the supplies listed below. Also, you’ll want to join us again next Wednesday as we feature another hop with all new projects! And, don’t forget to click to get to Sarah’s Blog for the next stop on the hop. You won’t want to miss her clever project. Thanks for stopping by!